We didn't think much about lighting when our house was being built, so it ended up being fitted out by the builder just like every other new home with standard white plate light switches. The lights themselves however were all the recessed R50 spotlight types. We went through a variety of different ideas for lighting control before settling on using "Intelliswitch" switches for the majority of the house. When thinking about home automation most people assume that this includes having all your lighting under direct control of some computer system. You can then control everything from a central point, do cunning scene lighting, and magically turn on and off lights during the day. Since our house was already wired up and we didn't fancy rewiring to install any of the number of lighting solutions available this left us with a difficult problem. X10 devices are commonly used to control things like lighting and lamps because they don't require any rewriting. You can simply use plug adaptors or light switch replacements and the devices communicate over the power lines. So our first experiment was using X10 for lighting control. The switch most commonly used for this is the LW10 which can turn lights on and off, dim them, and be controlled by the X10 protocol from other things. We didn't much like the look of the LW10; it's chunky, sticks out of the wall, and according to folks on various X10 forums constantly blows fuses. Perhaps the biggest problem with the LW10 is that you can't remotely tell it to go to a discrete dim level. You can't say "Dim to 50% brightness", only "Dim by X steps". Since we wanted to do scene lighting this was far from ideal. Also in the UK these things are quite expensive; you don't get much change out of UKP30 per unit. So we bought one from Laser and put it in the living room, controlling 10 25W R50 spotlight bulbs. We can't fault the function of this switch, it works reliably and we can set the level remotely, or using a remote control with a IR X10 receiver in the same room. However these things are designed to be fitted to continental backboxes and it never really looked in place. See a picture of the lw11 in the living room. We couldn't put the right switch rocker in because the switch is slightly twisted and it just constantly catches on the edges stopping it from working reliably. Also these switches are a bit more expensive than the UK LW10. Another problem we had in the house was over-voltage which dramatically cut the life of the expensive spotlight bulbs. Actually the only place where the life of the bulbs was not affected was in the en-suite bathrooms which we had fitted with touch switches we'd bought from somewhere like Argos. 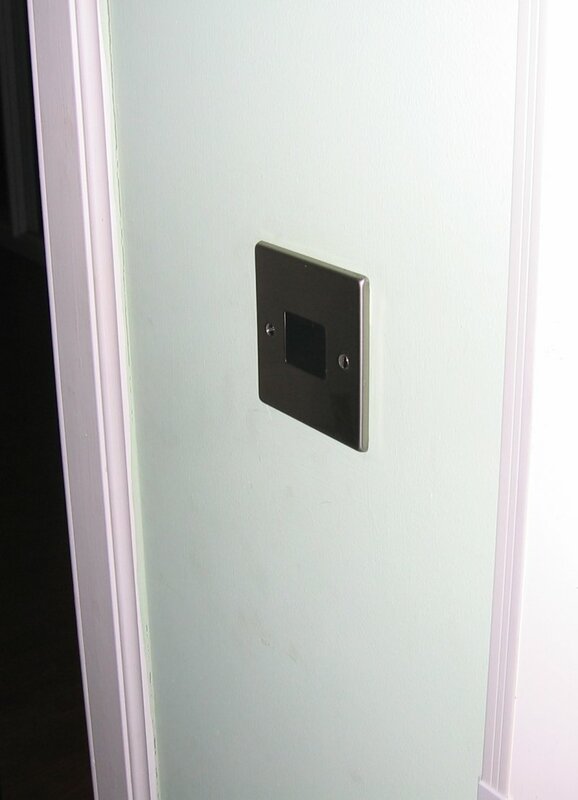 These touch switches were white, had a LED in the centre, and allowed you to turn lights on and off (and critically for the ensuite allowed the lights to turn themselves off after some number of minutes). These switches also had a soft start which we figured was mostly responsible for the increased lamp life. So we decided that dimmers were the solution for rooms where we didn't need automatic control of lighting. The big blocky white switches from Argos were not really approriate for the look of the house. We looked around and found some amazingly nice looking dimmers that also were able to be controlled by infrared. We bought a few of these from TLC and installed them in the kitchen and bedrooms. Unfortunately it wasn't long before the first switch stopped working with a burning smell from inside it. A month or so later the second switch stopped working in an identical way. We gave up and sent the switches back, perhaps they didn't like the high voltage in the house, they certainly were not overloaded. So by now we'd figured out that we didn't really need to be able to control every light in the house and in fact just the main living room lights made sense to control and dim for watching movies and so on. We also figured out that we really needed to use dimmers with a soft-start function to help prolong the life of the bulbs. 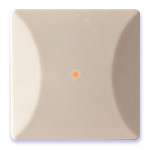 I don't know how we found it, but the touch switches we had installed in the ensuite bathrooms were made by a company called "Touch'n'glo" in the UK. 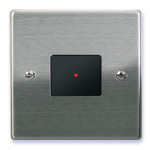 Hunting around google we found a web site for them, selling a range of "Intelliswitch" dimmers. The basic dimmer allowed you to touch the light switch to turn the light on and off and hold it down to dim. They were available in some lovely brushed metal finishes, had switchable colour covers to blend into the decor of the rooms, were not too expensive, and just looked perfect. We chatted to their sales director and found out that the switches were designed and built in the UK and that they would soon also be available with slaves (for two or three way lighting like on our landings) and as multiple gang switches where you want to control more than one light from the same place. Perfect! We promised to write up a review of the switches and ordered about 10 of them with a slimline brushed stainless steel plate. The web site does a good job of explaining how these work and it's really as simple as it looks - replacing all ten of the light switches took only an hour or two and it took us longer to decide what colour inserts to use in each switch I think. The only difficulty during installation is making sure that you have the load and supply leads correct - the way our switches had been installed it was impossible to tell from inspection and we had to rely on a voltage meter (and careful fingers!). We've been using them now for around nine months without a single incident, including dimming of some mains halogen GU10 fittings. The switches just work, look great, and visitors always admire them. Some of the switches have a slight humming noise when they are on which you can hear when very close to the switches, but that is something you'd find with any dimmer working in the same way. So what are the downsides? to me the only real downside is that they're not computer or even infrared controllable. The geek in me wants to be able to control them remotely. If these things were X10 compatible those horrible white expensive X10 switches would be left on the shelves forever. You can now get RF switches that don't require rewiring that give you computer control, but they can cost five to ten times the price, per switch, so it's not very economical. 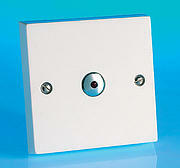 These intelliswitches are around the same price as you'd buy a standard metal wall switch from some large DIY chain. Okay, there is one more downside that I wasn't expecting. I was waiting for the Intelliswitch folks to release their 2-gang and slave versions of the switch so I could finish converting all the switches in the house. At the moment you walk in and see a hallway with two nice brushed stainless steel switches, and one horrible white place hall light switch. About half the switches in the house need the 2-gang or slave versions. Originally I was expecting these to be available in Spring 2004, but we're not into October and they are not available. Intelliswitch didn't reply to my mails, or phone calls with expected dates, and their web site has been broken now for a number of months. Companies house still shows Touch'n'glo as as existing. I do hope the company underneath is okay, these switches simply rock. Hi! I'm Mark Cox. This blog gives my thoughts and opinions on my security work, open source, fedora, home automation, and other topics.